Childrens lighting to treasure forever. 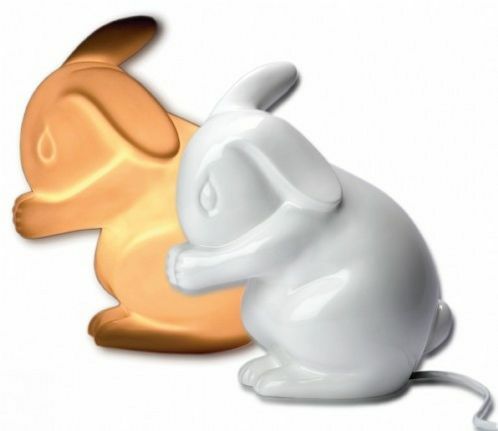 This award winning White Rabbit lamp is made from bone china in England. It won the award in 2009 for the Best British made gift. The light shines through the bone china giving off a soft glow. It is perfect for babies and little ones to reassure them during the night but also loved by grown ups aswell! Made in England by skilled craftsmen in the Staffordshire potteries, each one is hand made and hand crafted so that the quality is perfect. A beautiful addition to any babies nursery or childrens bedroom. Bone china is a very durable medium and tough to break, which is why china-ware has survived for hundreds of years. if looked after it, so will our lights. If you think about it we eat off china everyday and throw it in the dishwasher without a second thought. We advise you to simply tuck the cord away behind a chest of drawers or a bedside table and encourage your child to love it but not play with it. We package it for mail order so it arrives safe and sound too! All you have to do is plug it in and switch it on!